35th National Games 2014 Kerala will be held from 21st February to 7th March. The official mascot of the 35th National Games is Ammu, great hornbill. The National Games which was supposed to be held in Kerala in December 2013 have been rescheduled. The games will be held in multiple venues which include Thiruvananthapuram, Kozhikode, Kollam, Kannur and Kumarapuram. Being the most important sporting event in the country, Kerala is hosting the game for the second time with the first event held in 1987. The National Games which was supposed to be held in Kerala in December 2013 have been rescheduled. Kerala would be hosting the 35th National Games which is to be held from 21st February to 7th March, 2014. The official mascot of the 35th National Games is 'Ammu', great hornbill. The games will be held in multiple venues which include Thiruvananthapuram, Kozhikode, Kollam, Kannur and Kumarapuram. Being the most important sporting event in the country, Kerala is hosting the game for the second time with the first event held in 1987. The 35th National Games will certainly boost the sports culture of the people of the Kerala, especially among the younger generation. The National Games is considered to be the most important occasion which acts as a platform to discover new talents. More importantly, the Games would improve the sports culture and infrastructure in the State. It will create awareness among the sporting youth that training under modern facilities can create the required talent for competing in national or international events. 35th National Games will be a boon for further development of sports in Kerala in the coming years. 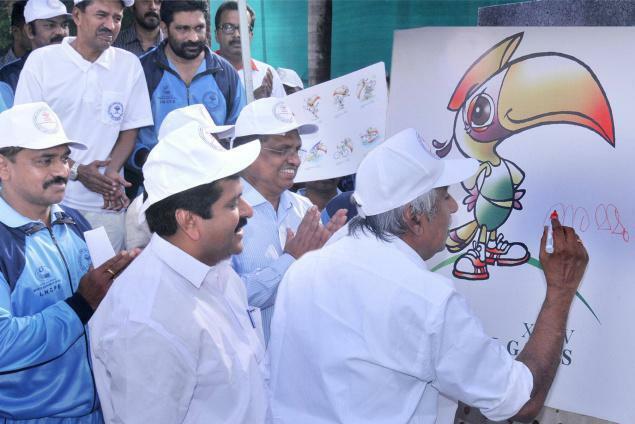 The naming of the mascot 'Ammu' was done by Chief Minister Oommen Chandy at the flag-off ceremony of the Olympic Day run which was organised at Thiruvanathapuram. Health Minister V.S. Sivakumar and NGS commissioner and principal coordinator Jacob Punnoose were also present during the occasion. Chief Minister wrote the name 'Ammu' on the white board while the participants of the run cheered him. The various versions of the mascot, illustrated by the Kerala State Chalachithra Academy will be used in the run-up to the games and also in all awareness campaigns to be held across the State. Adding more to interest, the games would create awareness among the sporting youth who would also be getting training under modern facilities. This would help them to boost up their talent for competing in national or international events. The National Games will be a boon for further development of sports in Kerala in the years to come. This is a very good resource that seeks to educative the people about the 35th National Games that will take place in year 2014. It is very important for the entire citizen to make it a reality and a success.